Lets take a kid fishing! There is nothing like seeing a little one’s face light up when they hook into a fish. I know this because I have literally taken thousands of kids fishing over the years to include my little angle… who by the way is quite the angler. She is only 9 years old but she has already caught redfish, whiting, sea bass and small sharks and to her they are all “big fish”. One thing that I know about kids is that they really don’t care what they are catching as long as there is action! 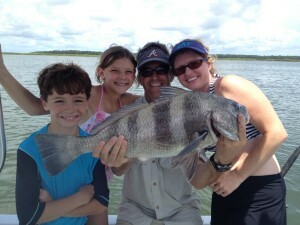 I try to customize all of my trips towards my anglers and that is especially true with the kids. Not only is a family fishing trip fun from the fishing aspect but there is so much to see and learn about while out on the water to include birds, marine wildlife and all of the odd stuff that we bring in while fishing. Every trip is an adventure! If you are looking to bring your family out on the boat I would love to have them! The best thing that you can do is to let me know how old they are and what their fishing experience is so that we can come up with a game plan so that they have fun. 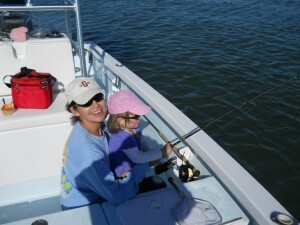 In my opinion the younger kids (10 and under) just want to catch something and they don’t want to wait very long for the bite. We can do that, but the fish are generally smaller which works out well so they can fight them on their own. As the kids get older we can get into more “quality” fish, but they need to have the patience between bites. And then there is always shark fishing. During the summer months the waters around Hilton Head are loaded with various sharks. What youngster doesn’t want to go home with stories about all of the sharks that they battled while on their summer vacation! No need to stay out of the water; though there are many sharks that frequent the beaches they are generally small and have no interest in us. We have a number of different shark fishing options from inshore bonnet heads to fishing in the Port Royal Sound for large black tips among others. Please note that all kids under 16 need to be accompanied by an adult. Throughout the Summer I run a special promotion for 3 hour family trips of up to 4 passengers (or 2 adults and 3 kids) for $350. This trip is especially cool for the kids because we will not only be focusing on the fishing but splitting the trip up into three different activities to keep everyone well occupied! For starters we will spend 1/3 of the day fishing, then 1/3 sight seeing and dolphin watching around the island and finally 1/3 of the trip netting the backwaters and identifying your catch and/or visiting the backwater beaches or sandbars depending on the tides. There is a lot of fun packed into this short trip and if this sounds like something exciting to you please just let me know upon booking that you are interested in the 3 hour Family Special!